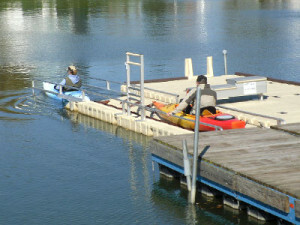 The St. Clair Boat Harbor rents canoes and kayaks by the hour for use along the scenic Pine River. We provide boats, paddles and life jackets. We now offer 9 campsites with 50 & 30 amp service, water hook-up and a dump station. All sites have a view of the harbor docks and within walking distance to all the restaurants and shopping. These 12 spots are located on the seawall to the right side when you enter the Pine under the bridge. Complimentary day-use docking is available on the north seawall, west of the fishing pier & in front of the art mosaic fish. The dock is 5 hours maximum courtesy of the City of St. Clair. No overnight docking is permitted. Ordinance 70-3. 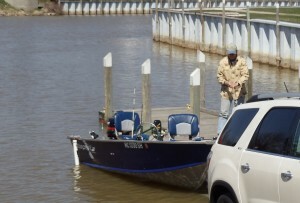 Fishermen are welcome to keep their boats at the harbor for $15/night plus the launch fee. The harbor defines a fishing boat as a boat 23’ or smaller, does not use electric or water and has no one staying on board. Not valid on holiday weekends. Not valid with any other special. This can only be booked the same day only based on availability. Enjoy a relaxing midweek stay at the St Clair Boat Harbor. We offer a midweek special Mon – checking out by Thursday all season long (excluding race week) where boaters can pay for one night and get the second night half off. Included in this special are several coupons for local area restaurants. For more information on pricing, call us at (810) 329-4125.